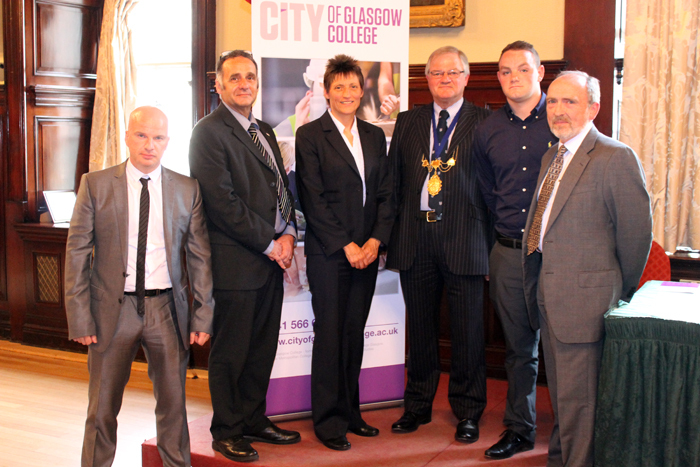 Deacon Brian Evans was delighted to be invited to the City of Glasgow College, Construction and Built Environment Awards Ceremony on the evening of the 20th June 2013. On the previous Tuesday the Deacon, Late Collector Craig Bryce and Lady McDonald Convenor Douglas Morrison had chosen the winner of the Lady McDonald Bursary and this young man will receive £1000 towards furthering his education at the Deacon's Choosing Dinner in September. The young man was also a student at the City of Glasgow College. 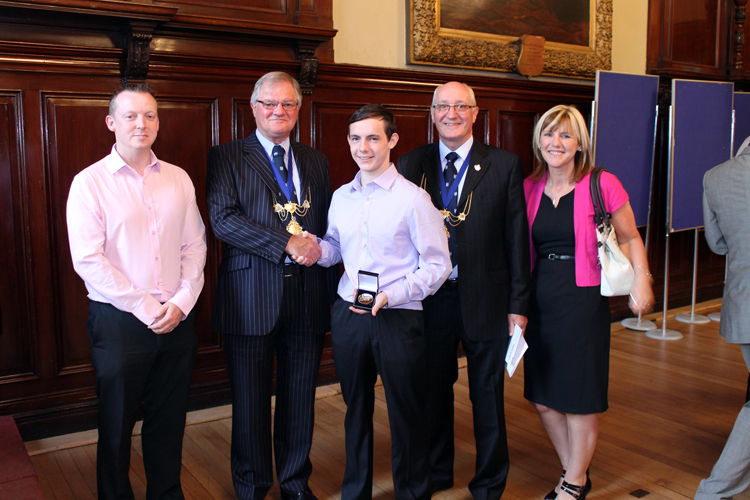 The Awards Ceremony is held each year in the Trades House and the students, staff and supporters of the prize winners are always delighted and thrilled to be in such a magnificent building. This year there were 54 prize winners invited to take part, unfortunately some were unable to attend. The photograph above shows, from left to right, Steven Gormley from Glasgow Stone Specialists, the employer of the prize winner, Peter Leitch the Director of the School, Carol Murray the Head of School, Deacon Brian Evans, Maurice McColl prize winner of the Advanced Craft Certificate in Stonemasonry and Peter Jennet the guest speaker for the evening. Deacon Brian Evans was also asked to pose for a photograph with Brian Feeney who achieved the best results in the category of NPA Bricklaying. Brian also did very well in the Inter College Pre-vocational Bricklaying competition. The photograph shows Brian's father Mr Stewart, Deacon Brian Evans, Brian Feeney, Late Collector Craig Bryce who was standing in for the Collector and Mrs Stewart, Brian's proud mother. It was wonderful to see that construction was still a vibrant part of the College life and that so many young people were still studying and achieving excellent results. Prior to the prize giving the Deacon and Late Collector had been invited to the pre presentation reception and afterwards to a small buffet where they had the opportunity to chat with the staff and some of the students. At the Deacon's Choosing Dinner on 20th September there will be many more students from City of Glasgow College, North Glasgow College and South Lanarkshire College who will be receiving recognition at this prestigious dinner.